Anticipation for the film ran high in the summer of 1996. The cult status of Escape From New York had grown, it was a reunion for Carpenter and Russell, and Carpenter had never directed a sequel to any of his movies before. 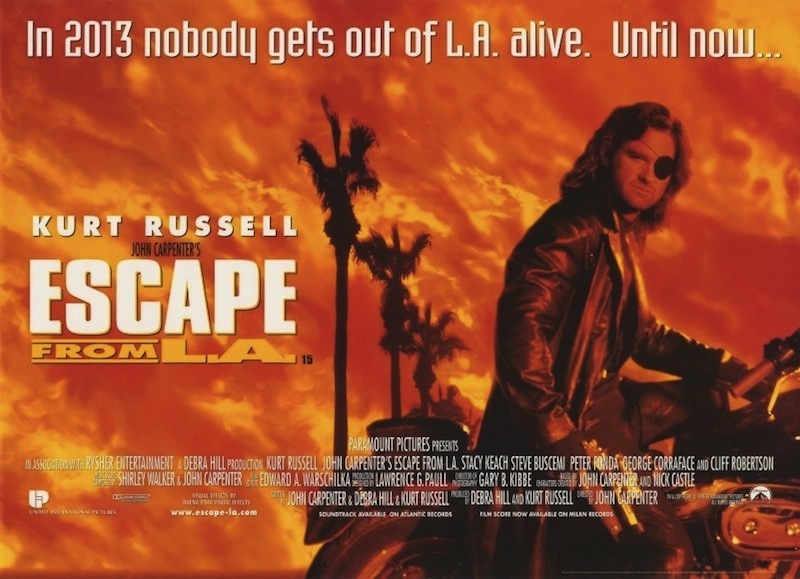 Unfortunately, Escape From L.A. not only imitated the story of the original, it imitated its box office gross as well. That’s not good considering fifteen years of ticket price inflation and a budget almost ten times as large. And thus, another financial disappointment for Carpenter. So, have you heard of this little flick called Escape From New York? Well, this is the same thing, except in Los Angeles. Okay, maybe it’s not that simple. We’re a bit farther into the future-past now. A massive quake hits Southern California in the year 2000 and turns Los Angeles into an island. The City of Our Lady, Queen of the Angels, is transformed into a deportation facility to remove all undesirables from the new, “moral” United States under the control of a theocratic president-for-life (Cliff Robertson). The island is walled off and guarded by … look, you saw the first movie. Same deal: once you go in, you do not come out. In 2013, the president’s daughter, Utopia (A. J. Langer), falls under the sway of the top L.A. gang leader, Cuervo Jones (George Corraface). She bails from Air Force One carrying a McGuffin Doomsday Doodad so she can join Cuervo in Los Angeles. The only person who can go in and retrieve the Doomsday Thingy is Snake Plissken, once again under arrest and scheduled for permanent exile. The president gives Snake less than ten hours to accomplish the mission before a toxin in his blood kills him. Plissken takes a secret sub to Los Angeles, where he encounters Steve Buscemi, Pam Grier, Peter Fonda, Valeria Golino, and Bruce Effing Campbell. I may joke that Escape From L.A. is basically Escape From New York version 2.0, but this isn’t an actual complaint. It’s exactly what John Carpenter wanted to achieve. Howard Hawks remade Rio Bravo (Carpenter’s favorite film) as Rio Lobo and El Dorado, and Carpenter wanted to try the same trick. All the beats are the same, each running joke has an equivalent, each character reappears in a Los Angelified variant. And the end results are often fun, like hearing a weird new cover of an old favorite song. Maybe it’s a bit weightless, but having Kurt Russell come back to play his signature role makes the trip worth the time. Russell is unquestionably the VIP of the movie. The character isn’t as well-written, but Russell is better suited to the part because the extra fifteen years look great on Snake Plissken — it’s his vintage. Kurt Russell can now do a perfect visual as well as aural Clint Eastwood parody. He clearly adores playing Snake and is out to make sure audiences who love the character as well get what they want. There are plenty of memorable Snake moments, most in the first half. “Sad story. Got a smoke?” “Well I guess I don’t need to know, so f**k you, I’m going to Hollywood.” Russell invests enormous personality in small character tics. I love watching how Snake reacts when he’s thrust into a VR simulation of Utopia making her speech on Air Force One before escaping. Snake only pays a bit of attention to his sudden new surroundings, then starts fiddling with his handcuffs. That’s some good, small character work. The best Snake Plissken moment, and the most Italian Western nod in the movie, has him facing off against three of Cuervo Jones’s pistoleros after a motorcycle chase on Sunset Boulevard. Snake offers to play a little “Bangkok Rules” showdown with them: he’ll throw a tin can in the air, and when it hits the pavement, everyone opens fire. Of course, Snake throws the can and immediately shoots down all three men. When the can lands, he delivers a laconic, “Draw.” Classic. Substituting the gladiator fight from Escape From New York with Cuervo Jones forcing Snake to play basketball against an unfair shot clock was an inspired move. It creates the movie’s most memorable scene and gives Carpenter an opportunity to indulge in his love of basketball. One place where L.A. has an advantage over the original is Carpenter’s familiarity with the setting and personal affection for it. The first film didn’t aim much of its satire at New York specifics, but satirical Los Angeleno comedy is all over the sequel, like Bruce Campbell as the Surgeon General of Beverly Hills guiding a cult of plastic surgery victims who need continual body replacements. I wonder how much of this works for people who aren’t intimately acquainted with L.A. the way I am, but it’s something I enjoy about watching it. The Los Angeles geography makes sense as well, although Snake couldn’t have traversed it at the speed he does. Most of the guest performances are fun, with tweaks to the Escape From New York equivalents. We’ve got Steve Buscemi as Map to the Stars Eddie, a con-artist twist on Ernest Borgnine’s Cabbie; Valeria Golino as the quickly dispensed-with woman you thought was going to be a love interest; Pam Grier as Hershe Las Palmas, the Harry Dean Stanton character (right down to Snake annoying her by using her older pre-transition criminal name, Carjack Malone), and Cliff Robertson as an unnervingly dead-on parody of Pat Robertson. A pack of actors from Big Trouble in Little China show up as the “Saigon Shadows,” which is nifty. Peter Fonda was a way out choice to play aging surf hippie Pipeline, a laid back dude who rides the waves with Snake and high-fives him in the silliest sequence. I suspect Pipeline is Carpenter’s self-insert and a nod to Doolittle in Dark Star and his memories of surfing the breakers at Malibu and Zuma. Carpenter musically contributes a rocking new version of the Escape From New York theme for the main titles and a neat Italian Western riff for Snake. But the majority of the score is from Shirley Walker, who previously worked with Carpenter on Memoirs of an Invisible Man. Walker is best known for her great music for Batman: The Animated Series and deserved more film work than she got. (She died in 2006.) Her score isn’t amazing, but it’s good, and she understood Carpenter’s preferred musical style. John Carpenter thinks Escape From L.A. is superior to Escape From New York. I understand where he’s coming from and why the second movie has greater personal significance for him. (It must have also felt good to have the tools of a studio at his disposal again and freedom to do what he wanted.) But I can’t agree with his assessment: New York is the far better movie, which hurts me to say as a near-lifelong Angeleno. The biggest reason L.A. falls short is it plays everything too broad and comic. The movie feels overly aware of what made the original enduringly popular, and works too hard duplicating what people liked. What was natural is now forced. What felt almost real enough to make the satire cut deeper is now blunted by cartoonish parody. It’s weird, but not a charming weird like Big Trouble in Little China and not an edgy weird like its namesake. Escape From L.A. never feels immediate or real. Los Angeles is better mapped out than New York, but the production design is more gaudy than cool. (This is strange since production designer Lawrence G. Paull also created the future noir Los Angeles for Blade Runner.) The best location is the use of the actual Los Angeles Memorial Coliseum for the basketball game. Most of the rest feels phony, lacking that tactile grit of the St. Louis shooting location for the first film. It’s strange how the larger budget somehow created a film that looks cheaper. While we’re talking about the budget and things feeling phony, well … Escape From L.A. contains some of the wretchedest CGI special effects of the era. Fifty million bucks is a tremendous budget for a John Carpenter film, but for a mid-‘90s blockbuster it wasn’t enough for even passable CGI. Plenty of ghastly computer effects followed in the wake of Jurassic Park rewriting the VFX book, and Escape From L.A. boasts examples of the worst. They’re so distracting they rip me out of the film. The practical effects from Escape From New York didn’t cost much, but they required ingenuity and retain a handcrafted beauty. The CGI in Escape From L.A. is ugly and uninspired. Snake’s voyage to Los Angeles in the mini-sub resembles a game of Mario Kart 64. The digital compositing of background plates to show the expanse of post-quake Los Angeles looks far worse than the glass and matte shots in Escape From New York. The tsunami surfing scene, which might have become an all-timer set piece in spite of its outrageousness, is ruined by the unacceptable fake wave and compositing. I don’t know how late ‘90s genre cinema survived the wonky CGI assault, but we’re damn lucky we made it through. Escape From L.A. is better than Mortal Kombat: Annihilation and An American Werewolf in Paris, I’ll grant it that. The movie has spry energy when it starts, but begins to taper off as Snake moves deeper into the island, and then crumbles after the basketball game. The story is poised to leap to the finale — this is the point in the original where the tension accelerated toward the race across the 69th Street Bridge — but instead Cuervo Jones relocates to Anaheim and Disneyland (named “Happy Kingdom by the Sea” for copyright reasons) and Snake has to find a way to follow, bringing the movie almost to a halt. The action doesn’t pull up the energy — Carpenter isn’t an action specialist anyway — and the hang glider attack and shootout at Disneyland is serious watch-checking time. The final confrontation where Snake pulls his double-cross on the president stretches out forever, even with a good final send-off where Snake shuts off the power to the world. It’s too stark a reminder of how much more tension was in the finale to Escape From New York, which wrapped up the same business in a terse white-knuckler. Escape From L.A. isn’t Carpenter’s longest film, but with the exception of Vampires no other feels as long, and it’s mostly the fault of the last half hour. One part of Escape From New York the new film doesn’t duplicate is Lee Van Cleef as Bob Hauk. Stacy Keach as Commander Malloy takes up the equivalent role, but not only does Keach lack Van Cleef’s charisma, his character just hates Snake and there’s nothing more to him. The unspoken respect between Snake and Hauk is the best relationship in Escape From New York, one of the secret tricks that elevated the movie and essentially made Hauk into the second lead. Escape From L.A. proves how critical Bob Hauk was because Snake and the movie are adrift without a similar anchor figure — the man who “gets” Snake and sort of likes him. Malloy is just another authority figure Snake can’t stand. And Malloy’s constant refrain of calling Snake “hotshot” gets tiresome after only the second time. If I could indulge in a bit of recasting, I’d have Peter Jason take over the Malloy part. Jason appears in a one-scene part as an officer who rattles off exposition to Snake as he’s brought to the deportation zone. Jason nails the small bit as he always does and shows interesting chemistry with Russell. If he had played Malloy (and Carpenter and Hill rewrote the part specifically for him), we might have had something. The Plutoxin 7 virus is a nonsensical substitution for the explosive artery capsules used to motivate Snake in the first movie. The reveal the virus is a trick — a non-lethal fast-acting case of the flu — is a nice twist on the formula. But this immediately begs the question: Why would you take the one man you need to complete a high-risk, possibly world-saving mission, a man you need to operate at peak condition and precision in a hostile environment, and first infect him with an aggressively acting case of the flu? There had to be a better way to psych-out Snake without making his mission arbitrarily three times harder. Snake does it again: he returns with the McGuffin gizmo — and then uses it to sabotage the whole mission, sending the planet back to the Stone Age by shutting off all technology. At least Snake’s still got those matches. Ryan Harvey (RyanHarveyAuthor.com) is one of the original bloggers for Black Gate and has written for the site for over a decade. He received the Writers of the Future Award for his short story “An Acolyte of Black Spires.” His stories “The Sorrowless Thief” and “Stand at Dubun-Geb” are available in Black Gate online fiction. A further Ahn-Tarqa adventure, “Farewell to Tyrn”, is available as an e-book. Ryan lives in Costa Mesa, California. Occasionally, people ask him to talk about Edgar Rice Burroughs or Godzilla in interviews. I think this is it, yeah. I remember going to see this movie with my best friend. We had grown up watching Escape From New York and were so amped for this movie, but when it was done we just felt deflated. My friend’s girlfriend, who had never seen EFNY, was also probably baffled as to what the hell the big deal was in the first place. I never really thought about how much this movie needed the equivalent of Lee Van Cleef but by God, you are absolutely right. Hauk is so important to the first movie. Just his little summary of Plissken’s career coming from his grinning death’s head convinced me that Snake was a Force Ten Badass. The movie was missing James Cameron’s undoubted skills in art design, too. I was also one of those people sitting in the audience opening night deeply disappointed. The humor and LA locals felt so very, very forced and in-your-face. In the first, it’s kind of in the background (example, Chock full o’ Nuts ends up chock full of nuts) or you have that theatrical show going on in the background as Snake is using the locater, and there’s Borgnine in the audience, enjoying the hell out of the show. Later you find out he’s not usually up that way but he really wanted to catch the show. Little touches like that bringing life to the secondary characters are missing. I also felt that I was supposed to dislike Jones for his Che Guevara getup. I come second to none in my dislike of Castro’s executioner, but he didn’t have much weight to him. The Duke was never presented as someone you needed to dislike, he was more of a great, battle-scarred tiger who’d made himself king of the jungle Snake had to overcome (the Duke and the President clearly hate each other’s guts and there’s a payoff to it in the end). Really could have used something like Frank Doubleday’s Romero. Bruce Cambell gave it a good try, but the whole plastic surgeon sequence felt like a Fallout side quest. Thanks for another interesting read. So very, very much bad 90s CGI. Sigh.